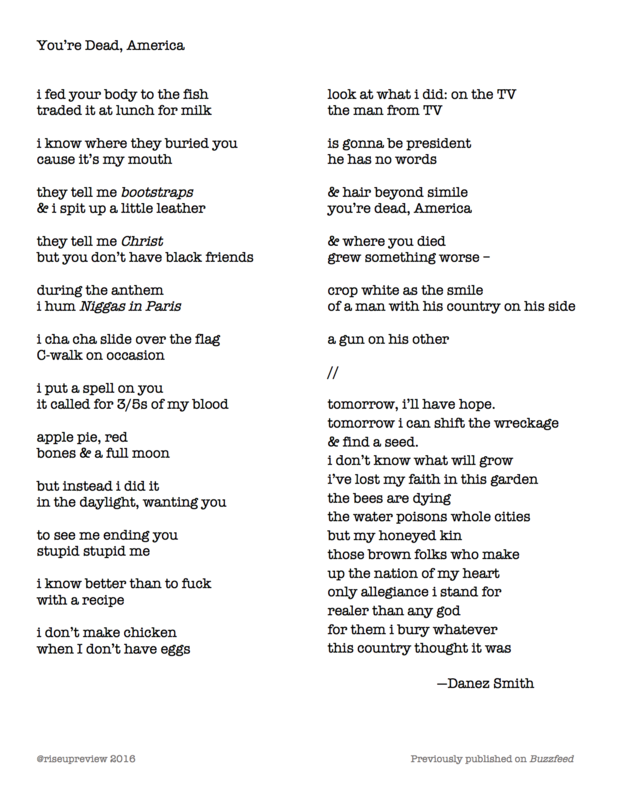 Danez Smith is a Black, queer, poz writer & performer from St. Paul, MN. Danez is the author of [insert] boy (YesYes Books, 2014), winner of the Kate Tufts Discovery Award and the Lambda Literary Award for Gay Poetry, and Don’t Call Us Dead (Graywolf Press, 2017). Danez is also the author of two chapbooks, hands on your knees (2013, Penmanship Books) and black movie (2015, Button Poetry), winner of the Button Poetry Prize. They are the recipient of fellowships from the Poetry Foundation, the McKnight Foundation, and is a 2017 National Endowment for the Arts Fellow. Danez's work has been featured widely including in/on Buzzfeed, Blavity, PBS NewsHour, and on the Late Show with Stephen Colbert. They are a 2-time Individual World Poetry Slam finalist, 3-time Rustbelt Poetry Slam Champion, and a founding member of the Dark Noise Collective.